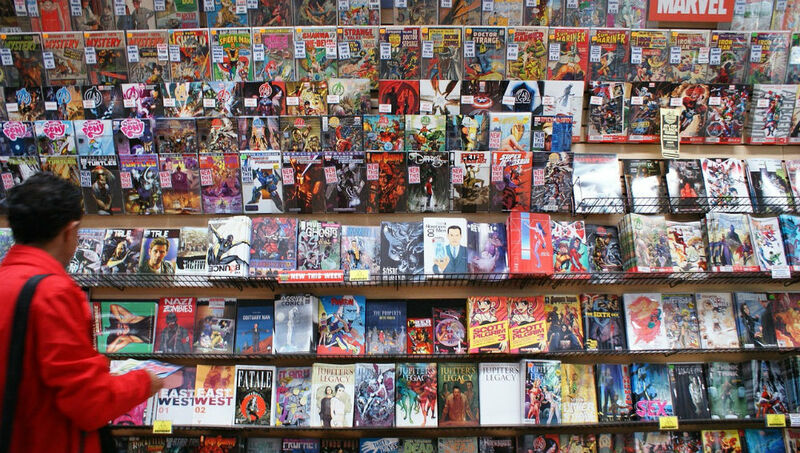 Last week on Twitter, there was a discussion on how reliant DC and Marvel, the “Big Two” of American comics, are on their various properties. Based on the discussion, I thought I’d look over DC and Marvel’s various franchises myself, to see if “Wolverine Publicity” (as TV Tropes might put it) really holds true. That’s all, if you’re looking for mainstream DCU material not tied in any way to Superman, Batman, Green Lantern, or the JLA. Meanwhile, the Batman books, including ongoing books using characters or settings related to Batman (including villains, sidekicks, etc. ), are truly lopsided: a whopping 22 out of 52 DCU-set titles, or 42% of DC’s output! The Bat-books include: Batman; Batgirl; Batwing; Birds of Prey; Catwoman; Nightwing; Detective Comics; Red Hood and the Outlaws; Justice League; Justice League of America; Suicide Squad; Teen Titans; Katana; World’s Finest; Earth-2; Batman/Superman; Harley Quinn; Batman and Robin; Batman: The Dark Knight Returns; Batwoman; Talon; and All-Star Western. It’s pretty obvious that DC and parent conglomerate Time-Warner rely on Batman a tad too much… which seems to be impacting their media side of things: Batman inserted into the “Man of Steel” sequel, the endless stream of Batman TV cartoons, etc. This lack of variety also doesn’t help DC/Time-Warner in their goal of matching or one-upping Marvel/Disney’s variety of superhero movies. Nor does it make the “New 52” a very diverse place, especially if one’s not a huge Batman fan. Assuming $4 an issue, it’d cost $88 a month to follow the entirety of the Dark Knight and his massive entourage of friends, sidekicks, enemies, and even settings (“All-Star Western” takes place in 19th Century Gotham City). However, in Marvel’s favor, the Marvel Universe comics aren’t dominated by one franchise to the degree that Batman dominates DC. The Avengers, X-books (even with Wolverine Publicity in force), and Spidey all seem to split up the Marvel Universe pretty evenly. There’s also some books that, while technically still tied to these three, usually stand on their own outside of the forced tie-ins: Fantastic Four, Guardians of the Galaxy, Captain Marvel, Deadpool, etc. Overall, while Marvel could use some diversity of its own, it seems in a better position than DC these days. Minorities in cartoons: "The Cat in the Hat Knows a Lot About That"